Over the course of running this blog, one of the big highlights for me has been making friends with countless other Pixar fans around the globe; so you can imagine how fun it was for me to actually meet a few of these people in person at the D23 Expo last month! Marco, who is part of the team that helped bring the famed Toy Story Pizza Planet truck to life in the real world, was one I was thrilled to finally meet up with. There we are below! That's right. 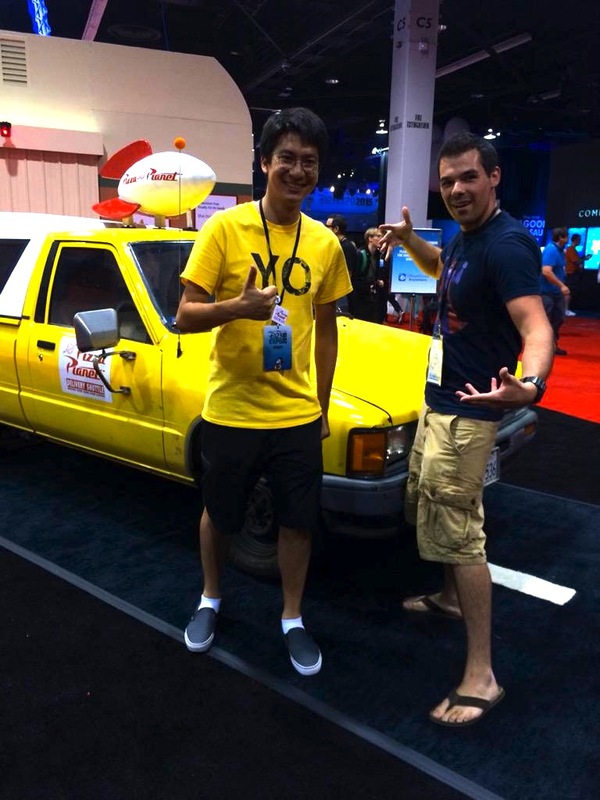 If you didn't know, the Pizza Planet truck exists and is a completely functioning fan-made vehicle! It really is a sight to behold. The Pizza Planet truck team created it from the ground up and it's a near perfect replica with just about every detail from the film that you can think of. Throughout the year, they travel around to different events while also documenting the truck's adventures on their blog pizzaplanettruck.com (be sure to visit their site for more details). Long story short, the truck has actually become quite famous and it was no surprise that they were able to get a place on the D23 Expo show floor! How cool to have that recognition from Disney·Pixar, right? To help the team raise the funds needed to keep the truck on the road and in working order, they offered custom Pizza Planet truck pins/buttons to guests there at the expo for just a couple bucks each. A big thanks to Marco for hooking me up with the two they had available! If you would like to donate to the cause by purchasing these pins, be sure to contact the team on their site HERE. They might be able to help you out. Check out these awesome buttons in more detail below! For more on my visit with the Pizza Planet truck and the rest of the convention, be sure to catch my full D23 Expo write-up this coming week. Many more pics and details ahead!